Malawian Vice President Saulos Chilima (file photo). 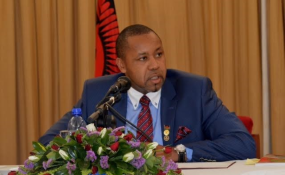 Vice President Saulos Chilima has said state bodies Malawi Revenue Authority (MRA) and Malawi Communications Regulatory Authority (Macra) are diverting money as 'special operations' to fund the the governing Democratic Progressive Party (DPP) campaign in the May 21 2019 Tripartite Elections. "We know that MRA and Macra bosses are taking money from these organizations under the disguise of 'special operations' yet you are giving the money to these people to do their campaign. "Today I have just named two but on Saturday I will name some more who are doing the same practice. You can come and ask me about this you know where to find me," said Chilima. "We do not have any special operations budget," Malata said. "When I say we will fight corruption with a tough stance I just mean that. Those who have stolen should start giving back now otherwise we will recover everything that was stolen from Malawians," said Chilima. Earlier on Sunday, Chilima joined the Catholic faithful at Njamba Freedom Park in Blantyre in commemorating Palm Sunday which marks the beginning of Holy Week to celebrate Jesus Christ's triumphant entry into Jerusalem before his death and resurrection.